FOSSIL SUNSPOT: A sunspot is emerging near the sun's eastern limb. The spot's low latitude and magnetic polarity identify it as a fossil from old Solar Cycle 23. This breaks a string of 23 consecutive spotless days beginning on Jan. 20th. Readers, if you have a solar telescope, take a look. Both satellites were completely destroyed. The expanding cloud of debris contains more than 500 fragments, substantially increasing the debris population at altitudes near 800 km. According to NASA, the International Space Station orbiting 350 km above Earth is in no immediate danger from the much higher-altitude debris. The US Air Force Space Surveillance Radar in Texas reportedly detected echoes from the debris cloud when it passed over the facility on Feb. 11th. Spaceweather.com is streaming live audio from the radar, and it might be possible to hear echoes the next time debris passes overhead. Try listening on Thursday, Feb. 12th, between 10:56 pm and 11:07 pm CST (0456 - 0507 UT on Feb. 13th). 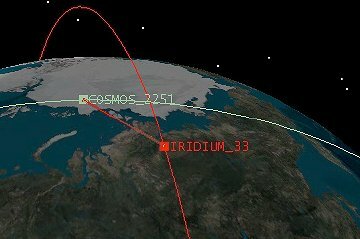 That's when Iridium 33 would have passed over the radar intact had the satellite not been shattered. UPDATE: Rumors are circulating that the debris is radioactive. Not true. These satellites were not nuclear powered. 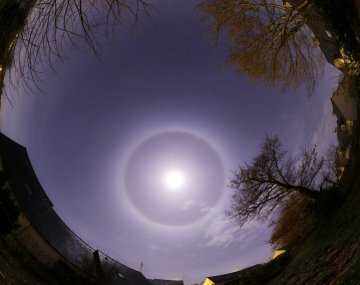 VIRTUAL REALITY MOON HALO: "Two nights ago, my sister-in-law Katy phoned me at 1 o'clock in the morning to say that there was 'a big crazy circle around the Moon,'" reports Laurent Laveder of Quimper, France. "I went outside to look and she was right: the sky was hazy, the Moon was very high and circled by a bright 22° ice halo." Laveder explains how he created the VR halo: "I took many pictures with my Canon 30D and a fisheye lens. Then I stitched the images together into a 360° panoramic view, which we are able to spin around using Quicktime VR." If it's cold where you live, be alert for more halos tonight. The Moon is bright and northern skies are icy--perfect conditions for the real thing. On February 12, 2009 there were 1025 potentially hazardous asteroids.